Here is my trick for great hardboiled eggs: place eggs in a pot and fill with cold water until covered. Heat water uncovered on high until it comes to a boil. Remove pot from heat, place the lid on top, and let sit for 11-12 minutes. Remove eggs after time is up and put in a bowl filled with ice water to immediately stop cooking. Peel and eat! In a small bowl mix mayo and pesto. I have a few pesto recipes here. Slice tomato and egg and season with salt and pepper. Toast bread then spread on mayo mixture. 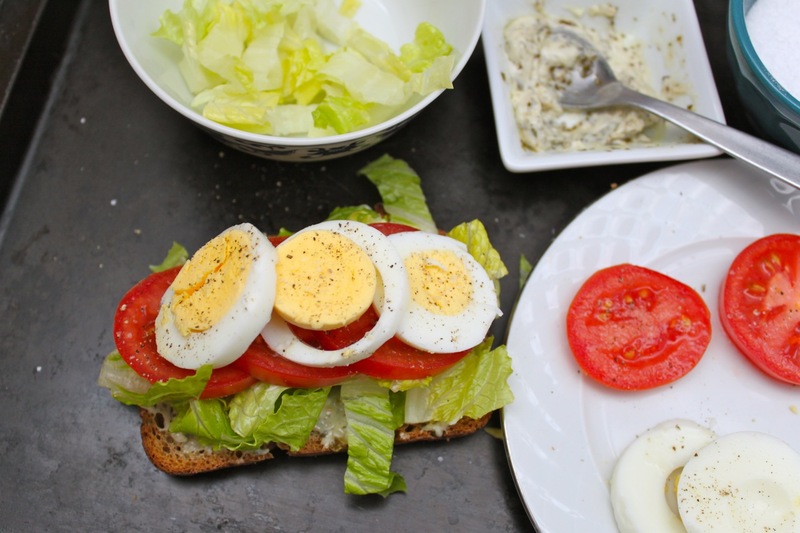 Top with shredded lettuce, tomato slices and egg. Enjoy! Laura, leave it to you to make me crave a hard boiled egg! Tomorrow’s lunch!